FDOA CEO Bill Redmon turned to Landmark to build an inflatable arch for its corporate fundraising races, the Big Kahuna Paddle Challenges. 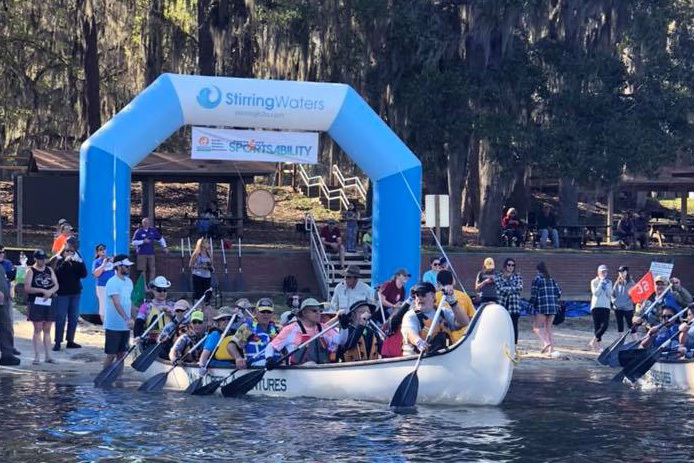 Sponsoring companies board 14-person team canoes to compete with each other in thrilling paddle runs... all for a very good cause. And Landmark's giant inflatable is at the heart of it all. Standing 15 feet high and 21 feet wide, the imposing inflatable arch provides a dramatic visual presence. As each team finishes the race, canoeists ring a special gong suspended from the arch. The effect is electrifying. At the first Big Kahuna Paddle Challenge, the custom inflatable attracted numerous visitors to the waterfront venue. Result? Visibility and free publicity for StirringWaters. Several similar events are planned for the near future. Says Redmon, "The inflatable really brings the event into the 'big leagues.' We now have communities asking us to help them create these unique community fundraising events to benefit people with disabilities." "We liked [Landmark’s] website," he reports, "we gave them a call, and we found them to be very helpful and informative. We got personal attention at the highest level."